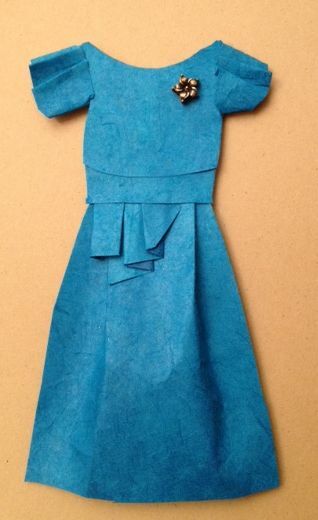 This dress is made of a luscious blue art paper. I liked working with it, and I'm sure it could be sewn just like fabric. Is it a half peplum? Or just a waist accent? Inspired by a dress in the window near the Buci Market in St. Germain de Pres. Paper with a decorative bead. Luscious! Definitely a waist accent and not a peplum (from a woman who hates peplums!). Love the pleated sleeves, too. Like a crisp blue sky on a perfect autumn day. Thanks, Eileen. Working with the paper was such a different, and pleasant, experience. And I agree, we'll call it a waist accent rather than a half peplum.